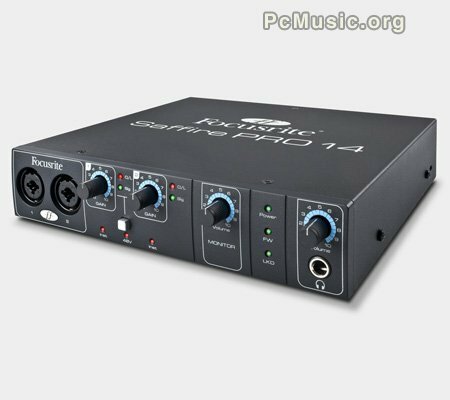 Focusrite is pleased to announce the addition of the Saffire PRO 14 to the Saffire range of audio interfaces. The Saffire PRO 14 is an 8 in / 6 out FireWire audio interface designed to make home studio recording and mixing easy without sacrificing audio quality. • two virtual Loopback inputs are also available for routing digital audio between software applications. Included with the PRO 14 is Saffire MixControl, an 18 x 6 DSP mixer. This software enables you to create six separate mixes with ultra-low-latency. Route any combination of input signals and sequencer outputs to any of Saffire PRO 14's outputs. Intuitive one-click configurations help you track, monitor and mix as quickly as possible. Saffire PRO 14 comes with all of the additional tools needed to start making music straight away. The Focusrite Plug-in Suite provides compression, reverb, gating and EQ VST/AU plug-ins. Focusrite's established Xcite+ bundle is also included. The bundle features Ableton Live Lite (for all your production, performance and compositional needs), Novation's Bass Station soft synth and over 1 gig of royalty-free samples from Loopmasters. The Saffire PRO 14 is expected to be available in August 2010.